576 Border Collie dogs turn up in Australian park to break World Record! Almost 600 dogs showed up to break a really important world record the other day! 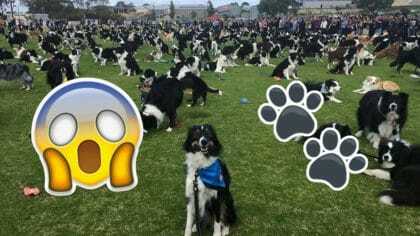 In Adelaide, Australia, 576 Border Collies (and their owners) showed up in a park to break a world record and to raise money for animal-related charities. The World Record Attempt was organised by the Border Collie Owners of South Australia group and raised almost £4,000 for three different dog charities. Owners paid a $5 entrance fee for the event which featured a variety of dog-related booths, activities, and treats. The organisation also allowed mixed-breed dogs to attend — as long as they looked like Border Collies. There was dogilates, where owners could learn how to do pilates with their canine companions. A photographer came to shoot portraits of the Border Collies and their owners. Although the event won’t ever be officially recognised by the Guinness Book of World Records, BOSCA still says that it’s the largest gathering of Border Collies in history. The previous record was set in 2013 when 503 Border Collies showed up under the orchestration of TV veterinarian Dr. Katrina Warren.